Keston Cobblers Club have a show coming up on Saturday at The Brewery Tap in Ipswich, here in Suffolk. See you there? Perhaps a bit of a trippy feel to some of the tracks this week including some valuable lessons in the joys of stereophonic recording from Public Service Broadcasting. The twin Graces are Grace Valhalla and Grace Woodroofe who are actually back to back. We’ve another track from a band I’ll be seeing on Saturday and a love song with a different, and very resonant perspective. Thanks, as ever, to the independent artists and labels who are producing all this fascinating music let’s support their efforts buy buying the stuff we love. Oh joy to have those awfully nice young coves from Public Service Broadcasting beaming their charming ditties into our lounges again, this time in steereo. Simply marvellous chaps, top hole. We don’t hear enough voices like that on the wireless anymore. Anna Nelson, known by her stage name Moxi, is a songwriter and performer from Los Angeles, California. After a short stint as a solo artist, Nelson teamed up with producer, writer, & multi-instrumentalist Andy Toy and took the stage as Moxi for the first time in late 2012. Floating on a soundscape of vintage keyboards, big backbeats, and her signature Omnichord strums, Nelson’s distinct soprano voice takes the listener on a wistfully introspective journey with her dreamy lyrics and melodies. Collaborating with Emmy award-winning producer and songwriter Bobby Hartry, Moxi is slated to release her debut EP In My Dreams in early 2013. Tyler Demorest, Danny Schnair, and Matt Cohen, known collectively as Kiven, hail from the smog-swept city of Los Angeles. While their musical influences have undoubtedly come from a wide array of musical and artistic spectrums, this trifecta ultimately blends together to create the band’s unique and personal sound. The band released their first EP, Two In The Same, in 2010 while still studying in school, and then followed with STEP in the spring of 2012. Following the initial momentum and direction of sound from STEP (their previous EP), the recently released EP, “1840” continues to progress forward both sonically and emotively, reflecting Kiven’s musical and personal growth. The tracks off of 1840 build in a more organic sense and with a naturally touching pull on the listener with pocket drums, grooving bass lines, hard hitting guitars, soaring vocals and lush harmonies. With the excitement of their new single, “Hope & Smoke”, which reached #11 on Hype Machine and was featured on Indie Shuffle and Red Bull Soundstage, Kiven made their East Coast debut in New York for CMJ 2012 as an official artist – playing a handful of showcases including The Deli Mag, Audio Perv and a handful of other buzz-worthy CMJ bills. Shortly after, Entertainment Weekly went on to name Kiven as the #2 “Great Indie Discovery” from CMJ 2012. Their debut full-length will be out in Spring 2013. 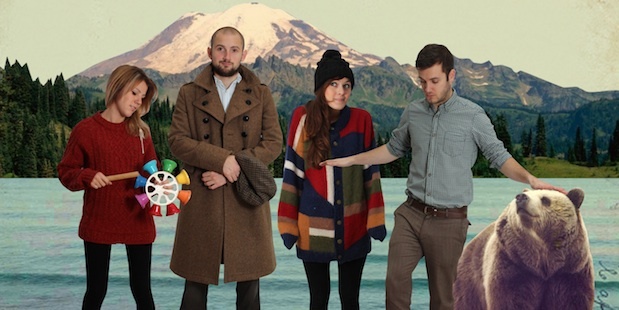 We had a first track from Keston Cobblers Club last week and if for no other reason than that they have a local (to me) gig coming up at the end of the week. Here’s another. A Canadian-Ukrainian duo comprised of Alexander Kretov and Shauna McLarnon who is originally from Whitehorse, Yukon in northern Canada. As are previous guests on the show Old Time Machine. She is apparently addicted to Russia and Ukraine, so she has lived there for about 12 years. Alexx handles composition, all instruments, arrangement and vocals, as well as recording, mixing, mastering and video production, while Shauna McLarnon deals with vocals, composition, lyrics and band management. In mid-July, Ummagma independently released 2 full-length LPs (“Ummagma” and “Antigravity”) on Bandcamp at http://ummagma.bandcamp.com. Despite the fact that Ummagma’s music encompasses several music genres, there persists a common remarkable theme, elevating and stirring effect. Ummagma was nominated for CBC Radio Canada’s “Rookie of the Year” Bucky Award and was featured in the November issue of Rolling Stone Russia. Another track from Grace Valhalla’s seminal 2006 album Peak~. Every track on this album is pure musical gold. Then there are Summer Camp and last year’s Valhalla Rising. Her set at the Aussie Barbecue was an altogether more upbeat affair in which the band even managed to blow the stage power. A track we heard quite a while ago (2011) but I stumbled upon it the other day and thought good enough to deserve another airing. Ultimately, she made her way to Peter Gabriel’s Real World studios in Box, England, where she created something that harks back to a different era of music-making: ten intimate, evocative songs, recorded direct to tape with a close-knit team of collaborators including producer Steve Osborne, drummer Patrick Hallahan from My Morning Jacket, and guitarist Ari Ingber of the Upwelling.